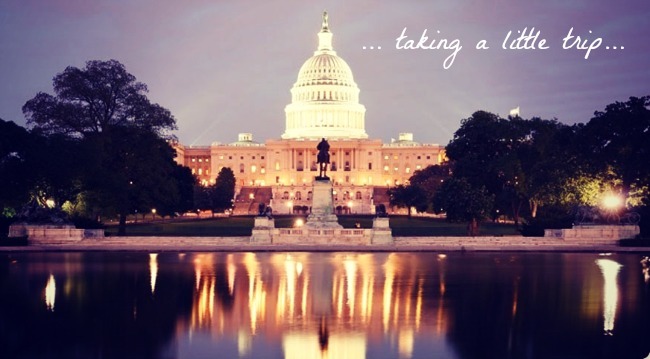 This afternoon I'm heading down to Washington, D.C. for a long weekend! I've been dying to get out of the city for a while now, and despite the dicey weather of late, now seemed like as good a time as any. I'll be celebrating a dear friend's birthday and catching up with some of my other favorite ex-Seattleites. a great Sunday Brunch spot is in Ballston (in VA but next to a metro stop) called FRONT PAGE. They have a buffet with a Bloody Mary bar and $1 mimosas. Enjoy! Secondi Consignment is right in Dupont and has some pretty good stuff-- while you are there you can pop into Teaism for some great tea (obvi) and snacks. Bonus because NEITHER are chains. The Beacon Hotel has a great all you can drink brunch at their Bar & Grill in Dupont area (across the street from the Human Rights building). They also have a good rooftop bar for happy hour. Make reservations though, it gets really crowded. Make a reservation and try the chefs tasting menu for dinner at Graffiato in Chinatown. It is more than worth the $55 a person (you can add wine pairings for an additional $35). Other favorites of the moment include Coco Sala (a chocolate lounge) - great with a few girlfriends, Zaytinya, Cafe Bonaparte - for lunch in Georgetown. If the weather is nice either day do Eastern Market. I'm always a HUGE fan of The Passenger, which is located by the Convention Center/Chinatown. What I really like about it is that there aren't your typical drinks there. You just tell the bartender what spirit your in the mood for and they make a drink for you! It was so great running into you at Zara in Georgetown! I knew you looked SO familiar from IFB Con lol. Such a small world. Next time you're in DC, we should all definitely have some sort of DC brunch/drinks date. also obsessed with Scandal. i wish i had seen this post earlier so i could have recommended the best places to go! hope you enjoyed your visit!